It shouldn’t be any surprise that I’m an Amazon Alexa fan. 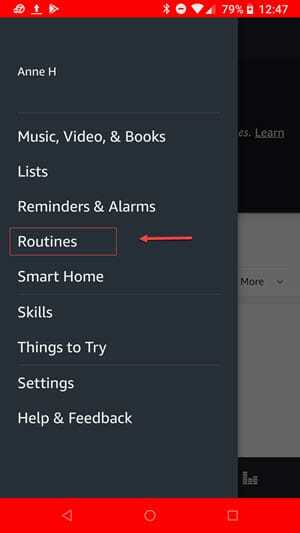 Naturally, I was intrigued when Alexa added a new feature called “Routines”. As the name suggests, it allows you to standardize certain actions for consistency. In theory, this works well, but it didn’t give me the flexibility I expected. I was hoping that anything I could speak, I could use in a routine. However, it’s still something worth exploring as it can make things easier. A “routine” is like a macro in that it can trigger a sequence of actions. First, you speak to Alexa a trigger phrase and she will execute the actions you assigned. Or, you can assign a specific time for the routine to run. These options can appeal to multiple personality types. For example, if you insist on waking up at 6 AM, you could use the timed option. Conversely, if you want to start a routine after you’re awake, you might use the voice trigger. Alexa is pretty flexible in this regard. I said “no” to each item thinking I would get the option later to edit this routine through the app. I’m still trying to figure out the Starbucks option as I make bulletproof coffee at home. My simple goal was to turn on a set of lights and hear the weather instead of speaking 4 commands. 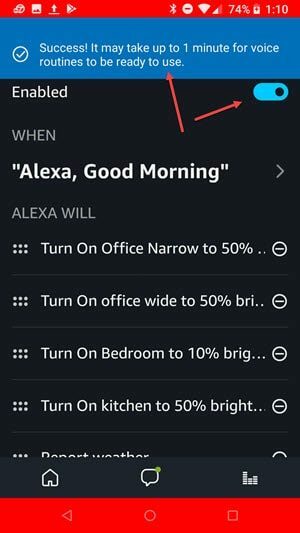 I ended up deleting their “Alexa, start my day” routine and creating my own. You may have better luck. The instructions represent the instructions from an Android phone, but I suspect they are similar to other devices like an iPhone. 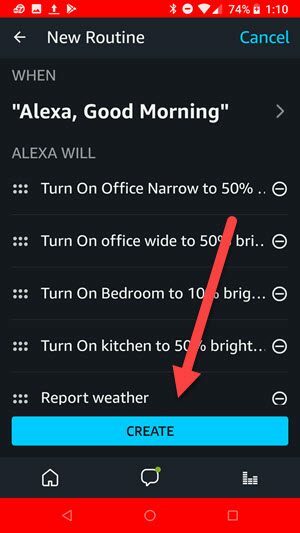 Open the Amazon Alexa app on your phone. Click the Home icon from the bottom. Click the hamburger menu and select Routines. Click the + icon in the top right corner. Click When this happens. This is your cue. You don’t have to click the icon to the right. At this point, you need to decide what will trigger your routine. 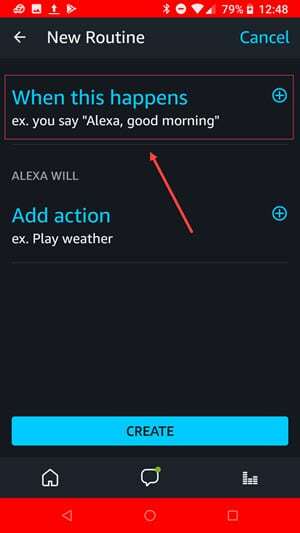 You can use a trigger phrase like “Alexa, good morning”. Or, you could set a scheduled time. For these instructions, I’ve used a trigger phrase. Type your phrase or use one of Amazon’s examples. Unlike the first routine options I heard, I didn’t see any area where I could add in the “7-minute workout” or the Wall St. Journal. Amazon support couldn’t offer any insight either. Once your actions are added, click The device you speak to under the FROM section. 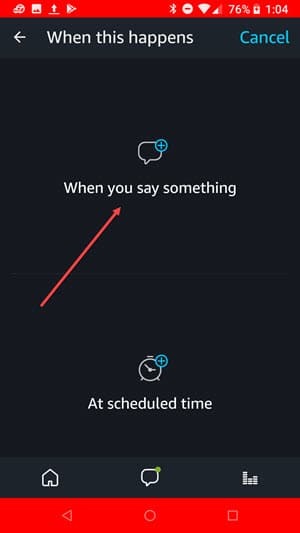 Once you’ve added all your actions, your screen will briefly change and show a system message at the top. The Routine is also enabled. Although this is a new a feature, there were some issues that I found frustrating. Lately, the Alexa app has started me on the panel promoting the new Alexa calling feature. It doesn’t give me a close box or another way to get back to home. It’s annoying as I don’t want this feature. I would prefer this was a setting so I could turn it off. If you have any Smart Home devices enabled you’ll see them listed. However, you cannot assign a routine to a “group”. For example, I have an Alexa group called “Office” that has 2 Hue bulbs. Instead of using “office”, I need to act on each bulb separately. Conversely, I thought it would be nice to create a routine that turns off all lights. Nope. My other frustration is I don’t always like to use my phone to interact with Alexa. Often, I find the web interface easier on my PC. 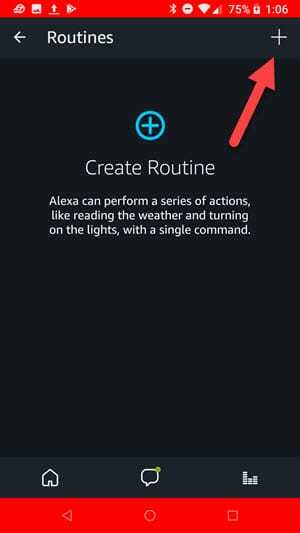 Except, Routines don’t appear on https://alexa.amazon.com. I’m guessing it will eventually. Despite my frustrations, I would try this feature. It’s a starting point that can save you from speaking multiple verbal commands, especially if you have smart devices. Moreover, I think it has promise. I can see Amazon allowing us to use “skills”, groups and maybe string routines together at some point.